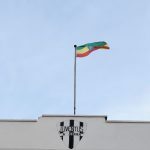 If one is talking about the Italian community in Addis Ababa, then one of the most important spaces of that community – along with the Italian Cultural Institute and the Church of San Salvatore – is the Circolo Juventus (images of Circolo Juventus), close to Meskel Square in the very heart of the city. 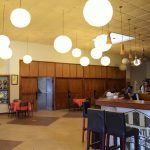 The Circolo is a social club that was set up by members of the community in the 1950s with the support of the Italian Embassy. In this recording, Fabio Botaro, who manages the Circolo, speaks about its origins, its different social and sporting activities, the types of cultural event that it organizes, and its likely future. 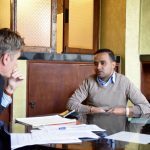 He talks about the way in which the Circolo has evolved as the Italian community has changed over time and how it has become a luogo di incontro between different cultures. As well as offering a space for different types of social interaction, the Circolo has its own photographic archive, its own Facebook page and its own journal (300 copies of which are printed). 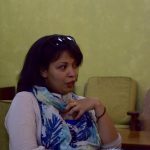 Cristina Toppo, one of the editors of the Gazzetta of the Circolo, talks in this recording about her own sense of Italo-Ethiopian identity and about how the Circolo has become a space that is used by many Italians who have come, like herself, to work for NGOs in Ethiopia.